« I’m a Mustang, Baby! OK, since this is “objets d’art” week in Blogstalking, I guess I should find some, eh? This is my favorite piece of art in the house. (Not the shawl, the chair) That is what is referred to in my family as the “Ugly Face Chair”. It belonged to my maternal grandparents and used to sit in their living room next to the tv. When I was a kid, it freaked the crap out of me. I used to make sure that someone (else) was sitting in it, so I didn’t actually see its face. As I got older, I realized how cool it was. When my grandfather passed away in 1997, I told my mother that I really wanted the chair, because it has such clear memories of Grandma and Grandpa associated with it. My brother, in addition to being a hair stylist, is also an artist. He has always been super-artistic, where I can’t draw a decent stick figure. (Not to say I’m not creative – I mean art in the sense of drawing and painting.) Anyway, these are a few of his (He has more posted on his MySpace page). He and I are trying to figure out a way to get a canvas from Las Vegas to Maryland without incurring massive shipping costs or having it damaged in transit. Until then, I just check them out on his page. Now I just have to find the most disturbing objet d’art in the house… We have a lot of geek-centric stuff (Kris’s small collection of wizard stuff, etc. 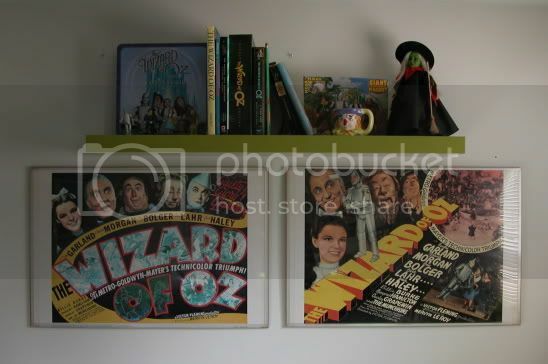 ), but I’m thinking that I probably have to bite the bullet and admit that my Oz collection is probably the most disturbing. ETA: Today’s mail brought me another set of swap stitchmarkers! Check out the gorgeous ones Turtlegirl sent me!! She said that the Knit Happens colors now make her think of me (since that was our original plan when she came up to visit), so she felt these were appropriate. I love them! Thank you, Cristi!! 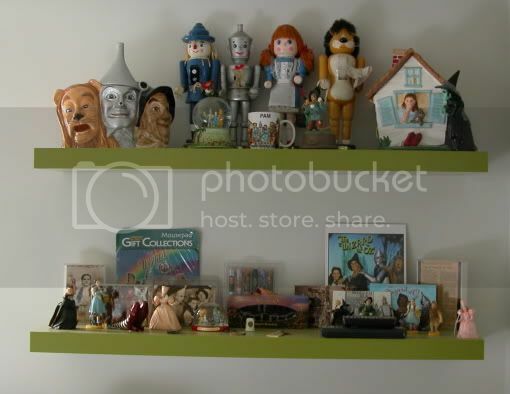 I have those little figurines! The broom head keeps falling off the stick, but otherwise, I love ’em! My sister has quite a vast collection as well. She played the Wicked Witch of the West in the High School play of it. Boy, did she ever get the cackle down. Freaky. 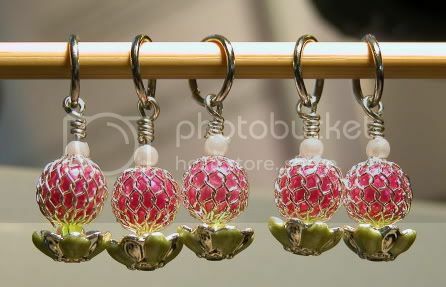 Oh, and your stitchmarkers from me should be there soon if not today! I love that chair. It reminds me of carvins I saw in churches in Ireland. I don’t think I could sit or eat in the same room as that chair! I love all the Oz stuff. Cool. 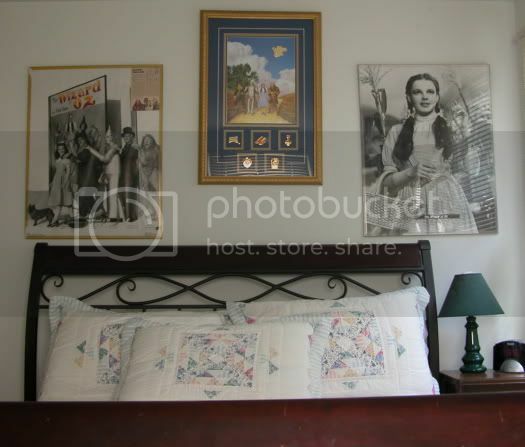 The chair is a bit creepy…but the wizard of oz! I love that movie!! I love the chair, but can more than understand why it freaked you out as a kid. Your collection is far less extensive than DH’s Star Wars collection was. I schlepped a painting from BC to Ontario as checked baggage on a plane. Does your brother ever fly out to visit you? I love that chair! Reminds me of medieval stuff, and medieval stuff is good (which is why I’m also a medievalist, but I digress). 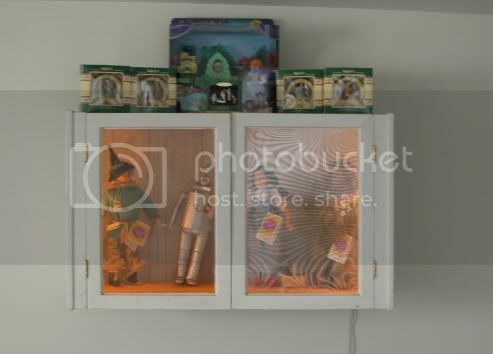 Some serious Wizard of Oz-age, too. I love your art! The chair is very cool. I like the Wiazrd of OZ, it’s tradition for me during Thanksgiving. My first ever blog I did was a refence to that movie. 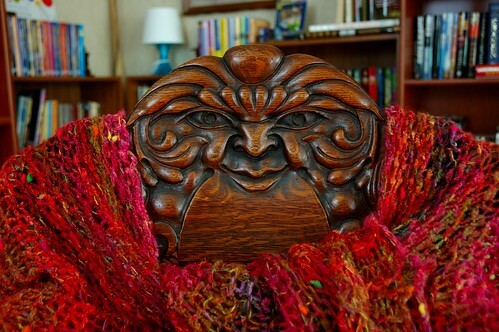 I like how happy the chair seems to be about wearing the shawl. Your brother’s work is fantastic. I love the deep red canvas with the dark triangle. It looks like it be right at home in the lobby of a wine bar. I think your chair scares me. I love turtle’s markers, though. What a freakin awesome chair! I don’t think it is an ugly face chair – although I might think the eyes are following me sometimes!